Fresh from recent huge successes in the video game world, the Danish brickies at LEGO are teaming up with the film part of Warner Bros. to create a full, LEGO-based motion picture. 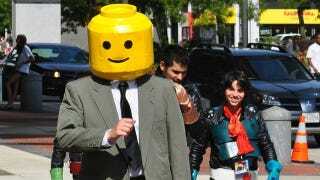 Due in 2014, the LEGO film is being written and directed by Phil Lord and Chris Miller, who were the co-directors behind 2009′s animated adventure Cloudy With A Chance Of Meatballs. Rather worryingly, Variety says the film will be "80 per cent LEGO", with the makers seemingly hoping to successfully combine human and computer generated actors.